White totaled just three points (1-8 FG, 0-2 3Pt, 1-1 FT), four assists, two rebounds, and one steal in 19 minutes during Wednesday's 110-105 loss to the Heat. White was brutal Wednesday, hitting just 1-of-8 from the field, ending with three points in 19 minutes. His production has been all over the place of late, coming at quite possibly the worst time for those in their fantasy playoffs. 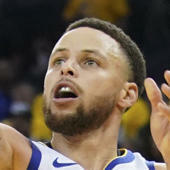 He remains a player that should be rostered in 12-team leagues but some owners may choose to move on if they need to stream his spot to boost their overall chances of victory.